Is the result of decades of development and experience in the retort business. The Multi-Process retort combines the flexibility of a rotary and full water immersion, with the efficiency of a spray retort. Is No. 1 for the sterilization of dairy products in plastic bottles and glass, but other applications as well. Proven reliability for more than 50 years, with hundreds of units in the market worldwide. Static, rotary or oscillating modes are available. These are the most efficient retorts when it comes to energy savings during pasteurization and sterilization. The right solution for your company’s R&D or public research facilities. It is designed in a compact way and covers almost every pasteurization/sterilization process you can think of. In the field of thermal processing of food, we offer many different solutions for a wide range of applications. As every product requires an individual pasteurization or sterilisation process, it is often difficult to select the right retort. Find out in less than a minute which one fits perfectly to your project and how many machines you need to reach the desired output. We are the manufacturer, distributor and service provider of retorts / autoclaves which are mainly used for pasteurization and sterilization of food and pharmaceuticals. Among other applications our customers produce baby food, meat, sausages, ready to eat meals, soups, milk, cream, vegetables and fruits, fish and pet food and a variety of packages, such as cans, glass, pouches, etc..
We are your one-stop contact for everything regarding thermal processing. 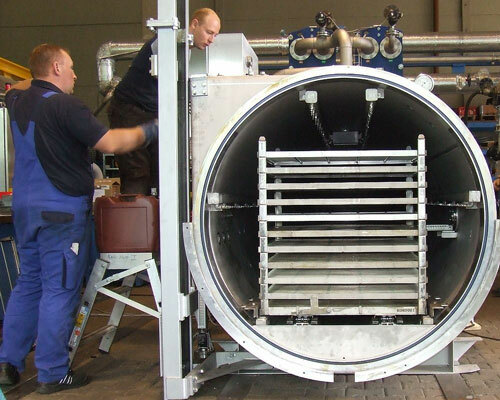 From retorts and product development to process validation and autoclave maintenance services we offer you everything for a safe and efficient production. In addition to new and refurbished retorts, we sell a lot of autoclave equiptment and spare parts. 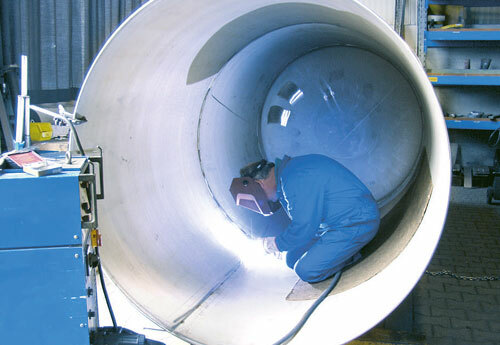 Overpressure retorts are a critical point in your production. This does not only apply to safety, but also quality aspects of your products. It is not enough to use the best ingredients and recipes if the thermal process isn’t optimal for your product. From static spray over rotary, full water immersion, to multi-process retorts, we have the right type for your product that matches your needs perfectly. Our retorts are real workhorses! With good preventative maintenance they can perform an excellent job for 30-40 years and sometimes even longer. We give many of them a second life and you a good chance to start your production or expand your existing capacities with refurbished retorts for a lower investment. Besides retorts, we provide all necessary equipment, cages, trolleys, spacer mats or trays. We also can offer this equipment for retorts from different manufactures like: Allpax, DFT, FMC, JBT, Molenaar, Lagarde, Levati, Lubeca, Panini, Steriflow Barriquand, Steritech, Stock, etc. Almost all important components to keep your retorts running, you can receive from us. In our warehouse, we maintain an inventory of many different parts like pumps, valves, trunnion rollers, race rings, etc., and are ready for immediate shipping. In most cases we are able to deliver retort spare parts within 24-48 hours and because of this, help to reduce expensive production downtimes. For high line speeds we offer the ABRS (Automated Batch Retort System), together with our partners. These are fully automatic systems in which products are automatically loaded/unloaded into cages and transported into and out of the retort. One operator alone can has the ability to control a complete sterilization line. We offer tailor-made modifications for the reduction of energy consumption with the addition of tanks or the installation of heat exchangers. Are you using an outdated control system that doesn’t comply with today’s requirements? Is your current control system working unreliably? We can help you! We are able to upgrade control systems from different suppliers (i.e. Allpax, DFT, FMC, JBT, Lagarde, Levati, Lubeca, Molenaar, Panini, Steriflow Barriquand, Steritech, Stock etc …), so that they match modern standards. To make sure that your retorts stay in a good condition, we provide regular service and training for your operator and maintenance personnel. Are you thinking about future trends or further developments of your product lines? We are at your side, together with our partners, to assist you. Together we find the right type of package, process, sterilization parameters, etc., for your ideas. It is completed by microbiological and chemical analysis, sensory tests and final reporting. It doesn’t matter if you are looking at specific spare parts for you existing retort, planning a big project or just have a general question about retorts and pasteurization / sterilization technology. With our broad network of partners in North and South America, Europe, Africa, Middle East and Asia chances are high that we have specialist near you! Please, don’t wait any longer and contact us right now!